Urban sprawl is a well-documented phenomenon that most associate with a negative connotation. According to Nechyba and Walsh (2004), urban sprawl is “the tendency toward lower city densities as city footprints expand.” The standard monocentric city model predicts this trend; the city edge outwardly expands at lower density as transportation costs fall and incomes rise. The Tiebout sorting effects heighten this spatial growth, to the point that many consider sprawl inefficient. Brueckner (2000) identifies three sources of market failure (unaccounted externalities) that cause this inefficiency: social value of agricultural land as open space, congestion from commuting, and necessary infrastructure for land development. Miceli and Sirmans introduce the holdout problem as another externality causing inefficient urban sprawl. Large-scale development projects require the acquisition of land from multiple owners. Necessary for urban growth, projects both public and private typically depend upon many individual transactions. When this information is known, individuals realize they can artificially inflate the price of their land. The holdout problem occurs when these individual owners assemble to extend negotiations and raise the price of multiple parcels, increasing transaction costs. Because these costs increase with the number of land owners, developers seek to lower costs by purchasing land from fewer owners with larger parcels – pushing development projects down the density gradient away from the central city. Miceli and Sirmans model a simple game to represent the holdout problem. A developer attempts to purchase land from two sellers, who can either bargain or holdout. There are two periods of bargaining, so holding out from bargaining in the first period results in bargaining in the second. The value of the land together to the developer is greater than to each seller (V > 2v). There is a cost c to delaying development to the second period. As a result, the developers payoff D = V – c – P~ (if both purchased in period 1), D = V – c – P1 – P2 (if one purchased in each period), D = V – c – P* (if both purchased in period 2). If forced to scrap the project after acquiring one parcel, the developer faces D = v – P1. The costs associated with delaying development (and the developer’s knowledge of those costs) provide for P* > P1= v, P~ > P* and P2 > P*, though depending on the magnitude of these costs P~ > P2or P~ < P2. Either way, the sellers are playing a non-cooperative game, though if the latter is true (c < (V – 2v)/2), the game is a prisoner’s dilemma. If c < (V – 2v)/2, the dominant strategy is holdout; the only Nash equilibrium is (holdout, holdout). If not, the Nash equilibria are (bargain, bargain) and (holdout, holdout); though the sellers, lacking full information on the delay costs, would most likely be unsure of which game they are playing. The joint holdout is the resulting equilibrium of the game; empirically we expect a delay of land assembly projects which increases as the number of parcels increase. From empirical evidence supporting the monocentric city model, land prices increase and lot sizes decrease as distance from the central business district decreases. Thus, the effect of the holdout problem steepens the slope of development costs versus distance from the city center. The market inefficiencies causing sprawl may be fixable. As many developers already know, maintaining secrecy about a project by using dummy buyers reduces the holdout problem. To counter urban sprawl, the government may implement policy to tax suburban development or subsidize inner city redevelopment. 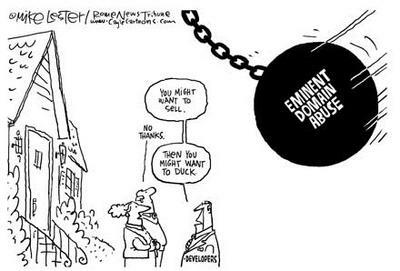 Miceli and Sirmans also suggest the government employ eminent domain to foster urban renewal projects, though use of such power to aid private development efforts may be controversial. According to them, the redevelopment of land close to the city center serves a public purpose by combating urban sprawl; thus the holdout problem can be seen as justification for the use of eminent domain. Brueckner, J., 2000. Urban sprawl: diagnosis and remedies. International Regional Science Review 23, 160–171. Miceli, Thomas J and C.F. Sirmans. “The holdout problem, urban sprawl, and eminent domain.” Journal of Housing Economics, Volume 16, Issues 3–4, November 2007, Pages 309-319, ISSN 1051-1377, 10.1016/j.jhe.2007.06.004. Nechyba, Thomas J. and Randall P. Walsh. “Urban Sprawl.” The Journal of Economic Perspectives, Vol. 18, No. 4, Autumn 2004, pp. 177-200.